SYDNEY (Reuters) - Former Australian Governor-General Sir Ninian Stephen, who worked on the Northern Ireland peace talks and served on the International Court of Justice, died on Sunday. He was 94. Prime Minister Malcolm Turnbull announced plans for a state funeral, saying there were very few honours that Stephen, who held five separate knighthoods, didn't have to his name. "Australia will remember Sir Ninian for his humility, his intellect, and his lifelong commitment to justice and the rule of law," Turnbull said. 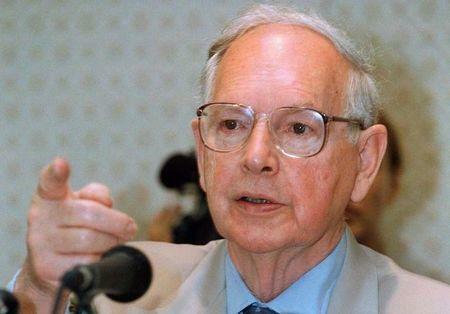 In his later years, he advised on South Africa's constitution, worked for the International Labour Organisation in Burma and was involved in setting up a tribunal to hear cases involving atrocities committed by the genocidal Khmer Rouge "killing fields" regime of 1975-79.